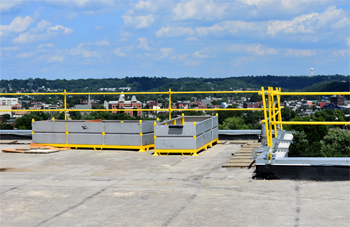 Roof Zone Zip Rail and Universal Guardrail Fall Protection Systems are OSHA approved and allow roofers to remain safe on the roof top of commercial buildings at all times. Each system is stackable, however must be shipped to a commercial address with forklift access. Zip Rail Systems are available in two kits: Parapet Wall Kit (Compression bracket) and Gravel Stop Kit. Each kit comes with zip rails, stanchions, corner brackets, and safety locking pins. The parapet wall kit #70736 comes complete with compression brackets and accessories for a total of 355’. The gravel stop kit #70755 comes with gravel stop brackets and accessories for a total of 420’. Additional accessories are also available to maximize the usage of the Roof Zone Zip Rail kits and Guardrail system. Universal Guardrail Fall Protection System consists of safety locking pins, 10’ universal guardrails, and lightweight bases. All fall protection products are made in the USA.